Warm sun and clear, turquoise water awaits you in beautiful Cancun, on Mexico’s Yucatan Peninsula. It’s one of many exciting tropical destinations you can reach hassle-free, through the Chicago-Rockford International Airport this winter. Thanks to popular demand, there’s an expanded schedule of flights to this sunny paradise. Cancun offers some 14 miles of pristine white sand beaches, many newly restored and expanded, where the Caribbean Sea meets the Gulf of Mexico. This tourist city is filled with adventures, relaxing resorts and natural treasures waiting to be discovered. And Riviera Maya, Playa del Carmen and the island of Cozumel are just a short drive or ferry ride away. Flights depart from and arrive in Rockford three times a week, and a variety of hotel packages are available in conjunction with Apple Vacations flights to Cancun International Airport. Stay at the classy, all-inclusive Sandos Caracol Beach Resort & Spa, which neighbors an exotic jungle with lagoons and lakes. Or visit the Dreams Puerto Aventuras Resort & Spa, complete with private balconies, luxurious accommodations, and daily rounds of complimentary golf on site. Specials are updated regularly. Many other resorts line the beach as well. Outside your luxurious, private resort, adventure awaits. In Cancun, visitors enjoy local markets, an exciting nightlife and plenty of fine cuisine. Cancun is surrounded by wild jungles and natural features unlike anything else in the world. Join the exciting adventures sponsored by Amstar, which offers everything from snorkeling, jungle river and underground cavern tours, to cruise ship dinners. Travel south of Cancun and visit even more resort, golf, cultural and shopping destinations. Beautiful Riviera Maya boasts numerous posh, all-inclusive resorts; you need never leave the comfort of your beachside digs unless you wish it. Nearby Playa del Carmen offers a wealth of local art and handicrafts, and fine jewelry and apparel shops set against a seaside port with ferries to nearby Cozumel island. Hidden in the jungles near Cancun are Mayan ruins, some still being uncovered. Explore the ancient city of Coba, carved into the cliffs above two lagoons, or visit Ek Balam, where something new is always being uncovered. 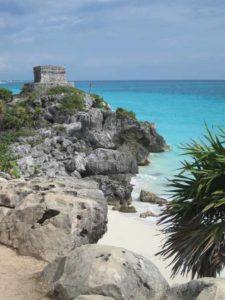 The walled city of Tulum, one of the most legendary Mayan ruins, is the only city-state built on a coastal cliff and was at its strongest between 1300 and 1500. Cancun/Riviera Maya tourists are also near to Xel-Ha and Xcaret, eco-archaeological parks where guests can swim with the dolphins, hike through the jungles and see one of the largest natural aquariums in the world. Given recent reports of violence in Mexico, you may wonder if the destination is a safe one. In fact, the U.S. State Department and various reliable travel sources report that Cancun is as safe as any large American city. Cancun’s average temperature is around 80 degrees, and the city enjoys more than 240 days of sunshine every year. Sound better than wind and snow? You’re only a few hours away. You’ll need a current passport to fly to Mexico, and they’re easy enough to obtain. Find more information about passports on the Web site of the U.S. Department of State, travel.state.gov. Cancun travelers find that going through U.S. Customs at the International Terminal at RFD is a snap. And as always, airport parking is free. Learn more at www.flyrfd.com about this and other hassle-free getaways made possible by Chicago-Rockford International Airport. This entry was posted on Tuesday, February 1st, 2011 at 10:19 am	and is filed under Uncategorized. You can follow any responses to this entry through the RSS 2.0 feed. Both comments and pings are currently closed.